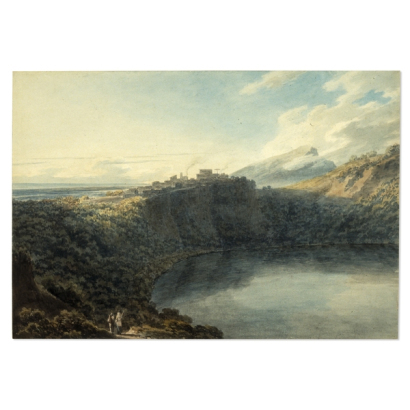 Lake Nemi, or Lago di Nemi as it is known in Italian, can be found in the Lazio (Latium) region of central Italy. The lake itself occupies a volcanic crater, overlooked by the modern town of Nemi and close to the ancient town of Aricia. The area is known for its astounding beauty, surrounded by the groves from which Nemi takes its name and the Alban Hills. As such, it has served as inspiration for a number of Romantic artists, such as John Robert Cozens (below). Now more famed for its delicious strawberries, this location was once a haven for Romans escaping the stifling heat of the city in summer. Only 16 miles south of Rome, many took advantage of the more temperate climate offered by the lake’s environs. The towns and villages of the Alban Hills were populated with luxury holiday villas, perhaps even including one belonging to Julius Caesar. The lake was also host to Emperor Caligula‘s ships . Although these pleasure barges were destroyed during the Second World War, surviving objects indicate that the ships were both technologically sophisticated and lavishly furnished with statues and marble. The area surrounding this lake was also home to a sacred site dedicated to the goddess Diana. For this reason, the lake was known to ancient poets such as Servius as ‘speculum dianae’, or ‘the mirror of Diana’. The cult of Diana Nemorensis (as legend has passed down to us) was a particularly brutal one, involving the ritual combat and murder of the priest of Nemi by his successor. This story is intimately tied to the landscape, as the challenger made his intentions clear by offering a branch from the grove around the lake. The excavation by Lord Savile in 1885 unearthed the remains of a temple on this site. Little remains of the building, as the wooden parts of the structure have been destroyed by time. However, models of Etrusco-Italian temples found at the site give an impression of what Diana’s temple would have looked like. The excavation also yielded many votives, objects offered to Diana in return for her support. Look out for upcoming blog posts on the mythology surrounding the site, the excavations and the votives found at Lake Nemi! This entry was posted in Ancient Sites and Myths and tagged Alban Hills, Ancient Sites and Myths, Caligula's ships, Diana Nemorensis, Emperor Caligula, Etrusco-Italian temples, John Roberts Cozen, Julius Caesar, Lord Saville, Romans, Servius, Speculum Dianae, strawberries, the mirror of Diana. Bookmark the permalink.